A WIZ750SR-based device that allows sending and receiving messages over LoRa and LoRaWAN. I got some LoRa modules with SPI communication interface. One of the options it would have been to connect them to my Raspberry Pi. But, I didn't really liked the idea because I already had some stuff connected to my Raspberry Pi, and this starts getting unmanageable. So, I decided to create a LoRa-to-Ethernet gateway that can be connected directly to a home router. The WIZ750SR module with its Ethernet interface and Cortex-M0 SoC was a great candidate to implement such a device. LoRa is relatively new long-range low-power wireless technology. LoRa uses license-free sub-gigahertz radio frequency bands like 169 MHz, 433 MHz, 868 MHz (Europe) and 915 MHz (North America). LoRa enables very-long-range transmissions (more than 10 km in rural areas) with low power consumption. The technology is presented in two parts — LoRa, the physical layer and LoRaWAN, the upper layers. In this project I implemented an Ethernet interface for the LoRa physical layer. This has the advantage that allows just using the LoRa PHY with our custom messages, but also allows implementing LoRaWAN if we want so. I used two 433 MHz modules purchased from AliExpress. The boards are powered by the Semtech SX1278 chip. After attaching a ribbon cable to the board and some pin headers to the other end the boards were ready for testing. I used two Arduino boards (a ChipKit Uno32 and a Genuino 101) and the arduino-LoRa library to test the boards. Note: the board uses the SPI interface and some GPIO pins for communication. This is not "exactly" the TTL serial interface supported by the WIZ750SR, but we will see how to fix this. The board allows controlling serial devices over an Ethernet network, but with a custom software is capable of much more than that. The board is powered by the W7500P SoC. The W7500P, according to its datasheet, uses an ARM Cortex-M0 core and along UART also supports I2C, SPI and standard GPIO. The SPI1 unit of the W7500P uses the same pins as the UART0 module (CTS = PA_11, RTS = PA_12, TXD = PA_13, RXD = PA_14) used in WIZ750SR module. This means that after some tweaking in the software we can use those pins for SPI communication. Along with SPI pins, we need 3 more pins. We can use the A, B, C pins of the WIZ750SR module, which are standard GPIO pins (PC_13, PC_12 and PC_9). After successfully getting through the Getting Started Guide, I started implementing the LoRa related functionality. As we seen before, the default firmware of the WIZ750SR does not support SPI, so we need to do some changes. 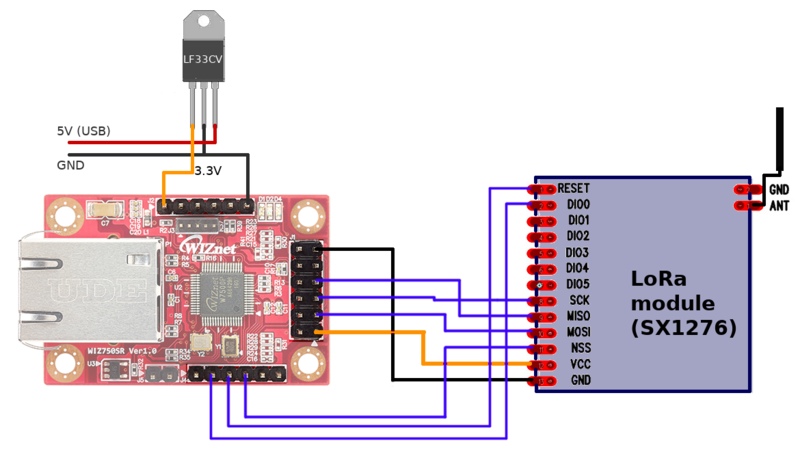 The first step was to create a new Cortex-M0 project and import official WIZ750SR code from: github.com/Wiznet/WIZ750SR. The next step was to change the code to communicate over LoRa instead of the UART. So, first I ported the arduino-LoRa library to work with the W7500P, then I changed the rest of the code to send / receive data over the LoRa interface. The rest of the WIZ750SR code is unchanged. This means all the non UART related feature are still available and can be configured from the WIZnet S2E Configuration tool. The final source code can be found in the linked GitHub repository. The testing setup was a wiring chaos (I forgot to take a picture). That was exactly what I wanted to avoid, so I decided to design a custom case for my Lora-to-Ethernet Gateway. The case was designed in Autodesk Inventor and it was exported to .stl files. Then using Blender I added some design elements for better look. The edited models were exported to new .stl files. The next step was to get the parts ready for the assembly. From the LoRa module I removed the pin header, shortened the ribbon cable and attached new pin terminations. Using an old USB cable and an LF33CV 3.3V voltage regulator I built a simple power supply. The module gets its power from an USB port (5V), which is used as the input of the LF33CV. The 3.3V output is connected to one of the VDD pins of the WIZ750SR. The USB ground is connected both to the LF33CV and the WIZ750SR ground pins. With this the Lora-Ethernet gateway was ready for assembly. After this the LoRa-to-Ethernet gateway was ready to use. We can use it either with raw LoRa or with can implement LoraWAN. For simpler application we can use LoRa modulation with or custom message type. This has the advantage that is easy to implement, but has some drawbacks too: offers no security example. The Arduino + telnet example shown above uses LoRa with raw strings message. In case we have multiple client devices, we can add some addressing. A good example is show in the LoRaDuplex example of the Arduino-LoRa library. For more complex application the usage of LoRaWAN is highly recommended. It offers some important advantages over raw LoRa, such us advanced security, and globally unique addressing. To use the device as a LoRaWAN Gateway we need the an application that connects both to our LoRa-to-Ethernet gateway and to the The Things Network servers. The Things Network is a global, crowd-sourced, open, free and decentralized internet of things network. We need to enter a unique, 8 byte gateway ID, and as we will use the legacy packet forwarder, the "I'm using the legacy packet forwarder" checkbox must be checked. Now we can send some messages from our LoRa test device. We case use the ttn-abp example from the Arduino-LMIC library, with the frequency set to 434 MHz. Listening at SF7 on 434.000000 Mhz. The full gateway app code and the Arduino sketch are attached to the project. The eclipse project containing the LoRa-to-Ethernet code uploaded to the WIZ750SR. The project was adapted from the official WIZ750SR, Serial-to-Ethernet project.